Thebest duck decoyswill work in your favor with minimal effort, instilling confidence in the ducks that the area you are trying to lure them to is a safe, habitable, and enjoyable environment for them. Decoys are also meant to reduce the hunter’s need to overcall in order to lure ducks by giving the feel of a natural environment. When implementing duck decoys into your hunting strategy, plan to assemble a collection of them – potentially up to a dozen or more, and practice setting them up in a realistic fashion. The more natural your decoy setup, the better it will work, leading to more fowl. Even when you’re working with the best duck decoy on the market, you are still expected to learn what works best for your location. Use a bigger number of decoy sets on large bodies of water, but stick to fewer decoys when hunting on ponds, streams, and creeks. If you set up your decoy set in a way that is unnatural, ducks will immediately be alarmed and they’re going to avoid your hunting ground. Another good tip is to place many of your decoys upwind from where you’re positioned. This strategy is especially effective in a situation where you have crosswinds . Simply set your decoys in an upwind corner of hunting blind so that the ducks will have to fly over you before going to their landing zone. Try to use a decoy that mimics the species that you’re hunting. If you don’t have decoys for specific species, bring ones that look the most like your target. Don’t use decoys with a shiny surface that can reflect sunlight. Ultimately, the success of duck decoys is determined as much by your strategy as it is by the quality and craftsmanship of the decoy. It doesn’t matter who makes the best duck decoys, ducks are smart and can easily detect when something is wrong. For this reason, it is important that you keep your decoy patterns realistic and strategic. For your decoy spread to be effective, you will need to place some thought into what decoys you want to use and how you want to use them. Ducks can easily spot decoys that are different in size and color to themselves. For this reason, you can have the best mallard decoys that money can buy, but if you’re hunting wood ducks, they aren’t going to be good decoys. Having your decoys bunched tightly together. Not creating a hole for a landing zone in your body of water. Overusing drake decoys early in the hunting season. Keeping old, worn decoys that have visible signs of damage. Putting weights on only the front or backside of your decoys. Avoiding these mistakes will make your swimming duck decoys appear more natural in movement and appearance. By having a decoy spread that is placed naturally, looks authentic, and situated in the water in a way that doesn’t alert other ducks, your hunting trip is more likely to be a success. Think of optimizing your decoy spread as an art form. There are so many things that go into making a good spread. For example, misplacing the weights on each decoy can make all of your ducks face the same direction, which is the formation that real ducks make once they’ve been alerted and are ready to fly away. Your goal should be to find the best duck decoys for the money, so that you can avoid these problems without breaking your budget. One of the most important features that define a good decoy is realism. Birds are smart and are easily alarmed when they see unusual colors and even textures. Fortunately, the technology behind making decoys has improved greatly from the days of wooden decoys. With the advent of plastic and feather duck decoys, you can put together a spread that looks realistic even to the human eye. Newer decoys are capable of moving around the lake or pond in a manner that simulates actual ducks. These battery-operated duck decoys flutter their wings, make noises, and paddle the same way that a real duck would. The more realistic that the decoy moves, the more convincing it will be to a flock of ducks. A good decoy spread is comprised of well-maintained ducks, so when you’re looking for a decoy to purchase, make sure that you buy one that is durable. Birds will notice scratches, faded colors, and damage marks on your decoy, which will make them hesitant to come to your hunting spot. Furthermore, it’s never a bad idea to bring a picture of a drake and hen for reference when shopping for decoys. This way, as you browse decoy spreads, you can examine the small details in appearance, like shading and bright color schemes, and compare it with your picture. If you’re an avid duck hunter, then you know how one simple mistake can scare them off, sending you home empty-handed. Ducks are intelligent and observant animals who are easily startled. Fortunately, having a good decoy can go a long way in helping you bag that prized drake. If you are in the market for some duck decoys, but you find yourself struggling to make a decision, then have a look at a few of the best decoy spreads on the market. This decoy spread comes with six high-quality mallard ducks. Final Approach has put an extreme amount of detail into making these ducks to ensure that they look as authentic as possible, even to the human eye. Every part of the duck, including the positioning of the tail feathers, has been carefully designed to mimic the real thing. The detail is one of the biggest selling points for this decoy spread. Every duck has been colored and shaded in a way that makes them look completely lifelike and anatomically correct. Furthermore, every drake and hen comes in a different posture, thus improving the chances of tricking nearby birds. The keels are pre-weighted and have been designed to not tip over. The entire set weighs slightly more than 12 pounds and has been made with durable material, so it can withstand years’ worth of hunting trips. Mojo Outdoors is known for their excellent hunting decoys, and this is no exception. This motorized decoy is designed to flap its wings in a way that mimics a duck landing in the water. It is a great addition to add to your decoy spread, and it will increase your chances of grabbing the attention of nearby ducks and lure them to your hunting spot. At just under three pounds, the Teal Duck Decoy is lightweight and easy to transport between hunting sites. Its realistic appearance and lifelike colors easily make it one of the most authentic decoys currently on the market. In addition, the lightning fast speed at which it flaps its wings makes it look like an actual bird. The Teal Duck Decoy is powered by four AA batteries, and it is expected to run up to 16 hours on a full charge. Its only drawback is that the pole is a bit short, meaning that you can only mount the decoy in a foot or less of water. Aside from that, the Teal Duck Decoy is a perfect lure for your duck hunt and will certainly help you in getting that prized bird. DOA Refuge Series Mallards 6pk. Along with the affordable price, one of the biggest advantages of the Refuge Series Mallard Floater spread is the amount of time and detail DOA spend in making the decoys look as realistic as possible. Each drake and hen is painted to perfection to look like actual ducks. There is also a considerable amount of detail that has been spent in shading and making sure that the patterns on the feathers look real. The Refuge Series Mallard Floater decoys are as effective in the water as they are lifelike. Weighing in at slightly more than two pounds a decoy, the decoy set is lightweight and easy to transport. However, the set is also heavy enough to move naturally as it floats on the water. Furthermore, the decoy’s hexagonal keel allows the ducks to maintain a more fluid, natural range of movement than other decoys. Another selling point to the Refuge Mallard Floater decoys is durability. Every decoy is constructed with high-quality materials and painted with a durable coat that is resistance to physical force and weathering. This allows you to hunt with the same high-quality decoys for years to come, which will greatly increase your chances of making the hunting trip a success. If you’re hunting in a larger body of water that is too deep for mounted decoys, the Floater Mallard Decoy is just for you. This motorized decoy is designed to simulate a duck landing in the water, which is perfect for luring nearby ducks into your hunting area. For this reason, the Floater Mallard Decoy is perfect for bringing any reluctant ducks to you. Mojo Outdoors has taken a keen attention to detail when designing this decoy. Its face and upper body have been carefully painted and shaded to look as authentic to a drake as possible. In addition, the decoy is also anatomically correct and positioned in a way that is both realistic and natural. For this reason, the Floater Mallard Decoy has been hailed as one of the most realistic floating decoys to hit the market. 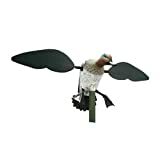 The Floater Mallard Decoy is 14.5 inches high and weighs roughly six pounds, meaning that it is lightweight and easy to transport to and from your hunting site. It comes with a rechargeable battery and charger, and a fully-charged battery will provide you hours of action. You won’t have any problems using it for the entirety of your hunting trip. Using the Floater Mallard Decoy is simple. Just place it in the water and turn on the switch. Watch as ducks become attracted to the flapping wings and splashing of water. The decoy has been designed to withstand even the roughest of waters without flipping over. However, it is water-resistant and can survive being completely submerged without any damage. When you are hunting duck, implementing a good strategy is the best tactic when using decoys. Setting the best duck decoy spread will greatly increase your chances of success, but in the end, it’s up to you to learn the habits and patterns of birds. When used correctly, decoys are an excellent way to enhance your hunting experience and help you bag a prized bird. Pick the ideal hunting spot. Choose one where ducks will actually want to land. When rivers and lakes begin to freeze, look for areas with running water, as ducks usually flock to these spots. During warmer seasons, look for the harder to reach places where ducks usually will flock to. Don’t hunt in an area overcrowded with other hunters because the noise and interference will affect your hunting. Know how many decoys you need by studying the type of water in your hunting region. Consider wind conditions and direction, as ducks usually land into the wind. Also, heavy wind may prevent ducks from landing altogether. Take note of the landing zone where ducks can land when they’re flying overhead. This can be an optimal spot to catch one, as there will be a whole lot in that area. Use special decoy gloves when spreading and handling them in the water. To stop your waterfowl decoys from drifting away in the water, tie weights to them to ensure that they maintain their position​ for the duration of the hunt. Dennis Holmes here. I bring you the best buying guides to help you to choose which tactical gear is the best for you as well as offering you a professional and fast service. I even give you some information about what to look out for when you’re buying tactical equipment.